Beyoncé Pregnant? : Could It Be To Save Her Marriage? HOLD UP! The Queen B is pregnant? Well a new report is saying that the 32 year old successful singer is expecting a new addition to The Carter family and that she’s hoping that this will save her alleged failing marriage. Could a second baby really save their marriage or place more stress on them? Will Blue Ivy become a big sister? In the Latest Ok Magazine the cover headlining “Beyonce Might Be Pregnant!” a Source close to the artist opened up to the magazine saying the couple has been acting very strange in fact this isn’t the first time they’ve act this way they act this way when Beyonce was expecting their now 2 year old daughter Blue Ivy. The Source Tells the Magazine: “For the last month, Jay has been fiercely protective of her, just like he was when she was expecting Blue Ivy. 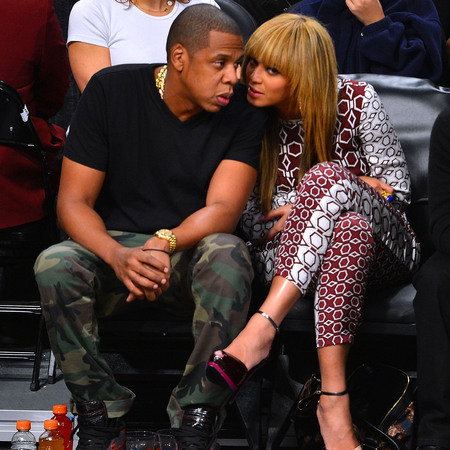 He’s been doing everything he can to ensure that Bey is in a stress-free bubble. He’s informed their entire entourage that they need to use relaxed voices, mellow lighting and listen to only soft music, and he’s said that all of the food Beyonce eats should be organic,” Hmmm relaxed voices, mellow lighting soft music & organic food huh jay? The Source goes on to say “He’s really doing his best to make sure that she’s as comfortable and healthy as possible.” Aww that’s so sweet of him — but this could also be something to win his wife back being that they have been on the rocks lately and Bey has shown us many signs of that. But Nothing has yet to be confirmed about this possible pregnancy but it would be amazing to see the two of them happy in love & expecting again. Do you think Bey is pregnant? Leave your answer in the comment below!